Tectyl is known for its innovative solutions, services and expertise in corrosion and rust prevention. 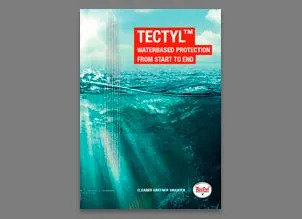 Tectyl coatings form an active polar binded rust preventative barrier and offers valuable protection for metal surfaces. Designed to resist the effects of moisture, salt spray and even harsh corrosives. Automotive OEM, Truck and Bus OEM and railway. Military spare parts, container and power generation. General industrial manufacturing, concrete industry. 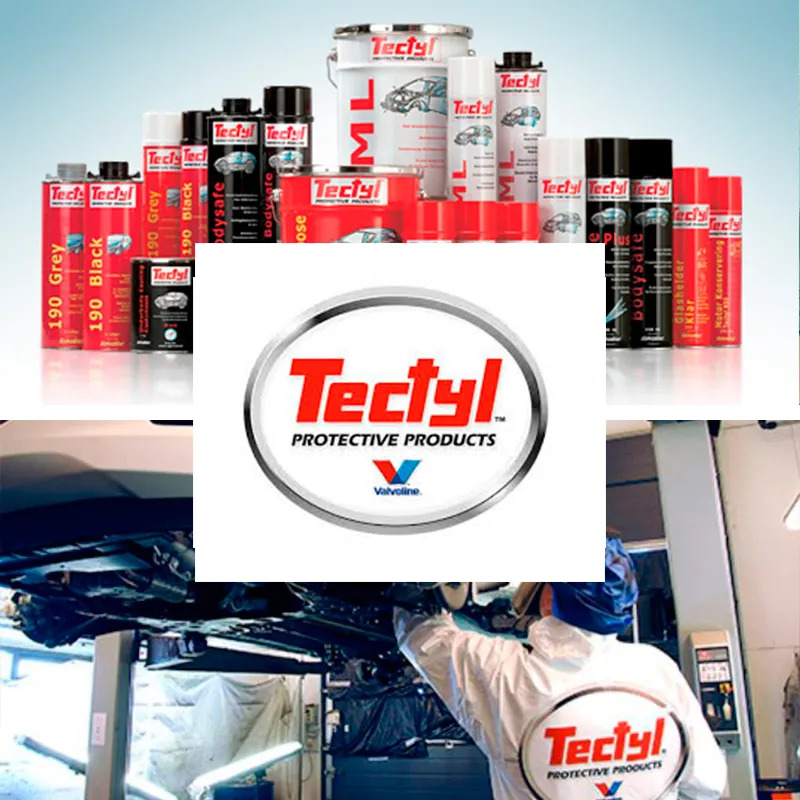 The Tectyl brand of protection products is owned by Ashland Consumer Markets (Valvoline) in the Europe, Middle East and African (EMEA) region. Consumer Markets, a commercial unit of Ashland Inc., is one of the largest independent international oil companies in the world with sales and operations in more than 100 countries. 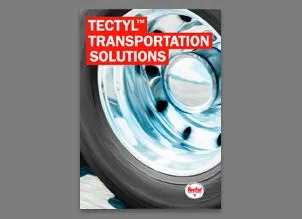 In EMEA, Consumer Markets produces a comprehensive range of Tectyl rust preventive products and lubricants for automotive and industrial applications. 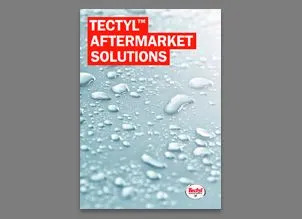 Through extensive market research, product development and quality control we can supply exactly the right Tectyl product for almost every kind of preservation process. 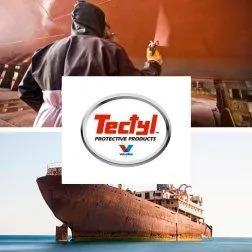 Tectyl™ protective coatings have been keeping corrosion at bay in engines, motors, generators, light machinery, pumps, heavy tools and spare parts for more than 80 years. The Tectyl name is synonymous with quality coatings that are easy to apply, long-lasting and easy to remove or de-activate when no longer required. 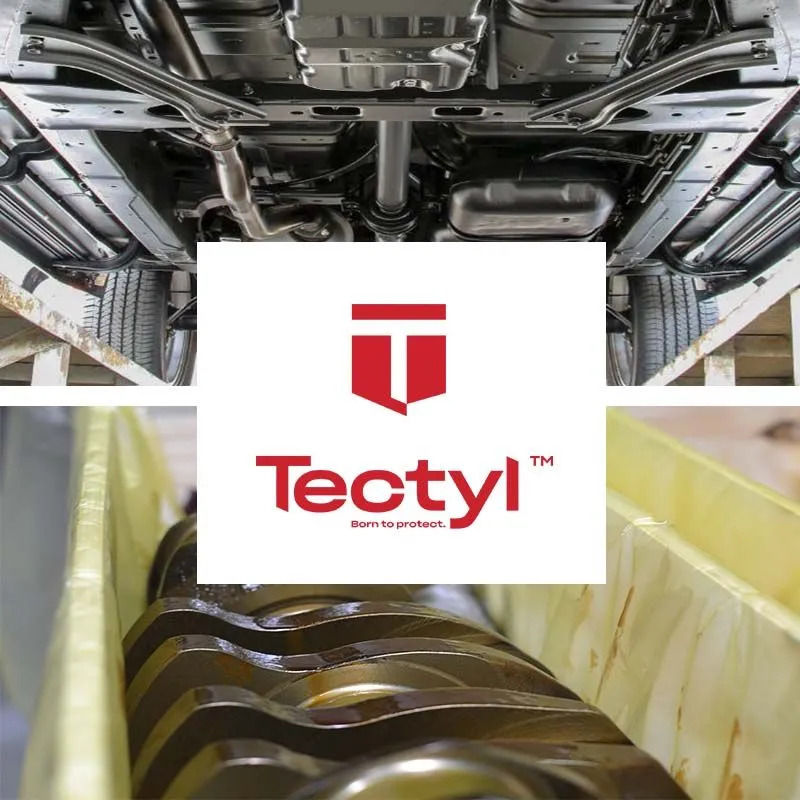 In addition to rust prevention, Tectyl also includes a complete line of sound damping products, consisting of various visco-elastic and sprayable silencers, suitable for many industries that should reduce vibrational resonances of metals. The ferrous and non-ferrous metal surfaces and cavities of a huge range of industrial products, parts and components need to be protected from corrosion. Protection can range from very short term solutions for application immediately after machining to medium- and long-term protection for complete assemblies in storage or during transportation. The solution is to apply the specially formulated Tectyl products, and we are ready to help you with our knowledgeable customer support organization. We offer products designed to protect the unseen insides of complex assemblies like engines as well as the exposed surfaces, cavities and sections or all types of industrial products. Tecty underbody and hollow-section protective coatings have been extending the working life of vehicles and protecting them during overseas shipping and long-term storage. Protect your product’s reputation with Tectyl. Even the most advanced paint coatings and plating techniques cannot guarantee total corrosion protection for steel in bus, truck, railway, automotive and other transportation applications. Rugged conditions, extremes of temperature and weather, salt and other minerals will eventually get through hard finishes and corrosion will take hold. The solution is to protect potentially vulnerable surfaces, cavities, seems and joints by applying specially formulated Tectyl products. This will keep corrosion away for years in all situations. Our many years’ experience in developing corrosion prevention coatings has also led to breakthroughs in other transportation applications, including coatings that significantly reduce noise and distracting vibrations. Both drivers and passengers in railway transport confirm that the application of sound damping has contributed to a more pleasant environment. Due to the friction between wheels and railway track or road surface, stones, sand and other loose parts hit the wheel arches and the underbody at high speed. By creating an elastic coating on the underside of the vehicle. Tectyl underbody coatings provide an excellent protection against stone chipping. 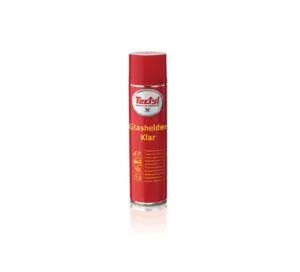 This prevents the start of many corrosion problems. Tecty protective coatings have been keeping corrosion at bay in engines, motors, generators, light machinery, pumps, heavy tools and spare parts. 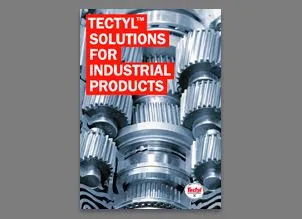 The Tectyl name is synonymous with quality coatings that are easy to apply, long-lasting and easy to remove when no longer required as well as types that can be left on without affecting the performance of the machine or part. Internal protection of combustion engines is simply removed by refreshing the lubricants. Prior to use or during transport, many motors, engines and generators need internal preservation. Tectyl products for this purpose are soluble in oil, facilitating easy removal when protection is no longer required. There are also grades available for both short- and long-term external protection against moist, salty or aggressive atmospheres. Tectyl develops products for the protection of exposed sections of pipes, tubes and castings during storage and transport overseas. Transport rail systems in harbours and other large open-air industrial sites are constantly exposed to the weather and other potentially aggressive environments. Tectyl helps extend the operational life and reduce the maintenance costs of these systems. Due to the seasonal nature of the work, farm, road and construction equipment needs medium-term protection while it is not in use for extended periods. The Tectyl possibilities include underbody and chassis protection as well as surface protection over a wide temperature range. The potential savings in maintenance and repair costs are significant, and the operational life of the equipment can be considerably extended. Tools, gear wheels, parts and bearings and other mechanical components need protection during storage and transport. We offer solutions that keep ferrous and non-ferrous parts in top condition. When the part is needed or arrives at its destination, the protective coating is easily removed, and in some cases, can even be left on. Precision parts also need protection during storage and/or transport, and the special needs of these fine mechanical assemblies are catered for by products in the Tectyl range. 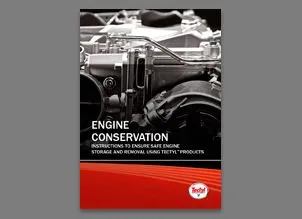 The detailed procedures for the storage engine and disposal storage using Tectyl products. 1. If the engine is in operation, the engine clean dirt and oil. 2. Run the engine at fast idle until the coolant temperature exceeds 80 ° C (170 ° F). 4. Drain the oil, clean the magnetic drain insert in which it is used and install the drain plugs again. 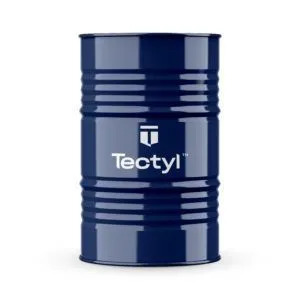 Use storage oil Tectyl 915W-40. This product can be used as a breaking oil and provide long-term anti-rust engine. to. Replace the old oil filter and the oil into the filter housing. 5. Fill the oil pan to the top mark on the dipstick with Tectyl 915W- 40. 6. Disconnect the fuel piping of the fuel filter motor and the return line of the injectors. * To obtain the exact degree of viscosity, refer to the owner for the next phase of the manual, use Tectyl 800D storing oil. 7. Fill a container with diesel fuel and the second container with protective oil Tectyl 800D (50/50). Place both fuel lines in a diesel fuel container. 8. Start the engine and put it into standby (about 30 seconds). 9. After the engine runs smoothly, the transfer of the fuel supply line to the oil storage container. 10. Run the engine until the oil preservative exit the injector return line. 11. Turn the engine off. 12. Connect the fuel hoses to the fuel filter and the return line of the injectors. 13. Drain the engine oil pan sump oil filters, air compressor and protective oil. 14. Drain the cooling system and the cooling filter if equipped. We should clean the cooling system with a rust-solubility. 15. Remove the suction and discharge valves. 16. 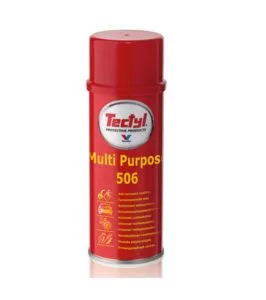 Mineral D Tectyl 930 Aerosol (if more than one motor or use wider Tectyl 502C / 502C-EH) in intake and exhaust manifolds and in the heads (make sure the engine is off). 17. Remove the cover or the valve covers. 18. 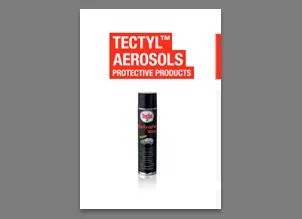 Spray rocker levers, valve springs, valve guides, control arms and rods with Tectyl 930 Aerosol for the use of a single motor or Tectyl 502C / 502C-EH for the multiple use of the engine. 19. After the application, reinstall the cap lids or valve. 20. Cover all openings with heavy paper and adhesive tape to prevent dirt and moisture in the motor.